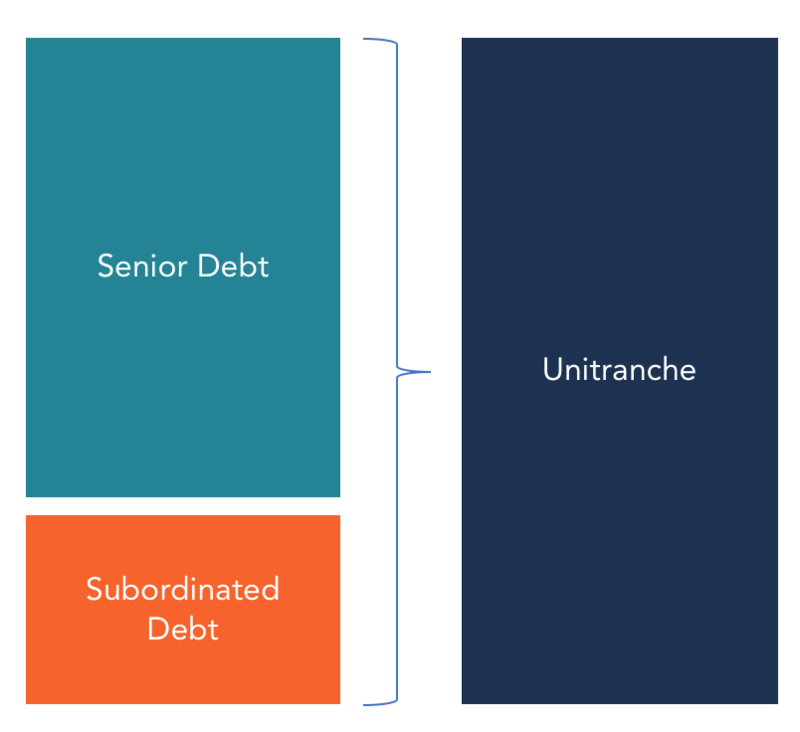 A Unitranche Debt is a hybrid loan structure that combines senior and subordinated debtSenior and Subordinated DebtIn order to understand senior and subordinated debt, we must first review the capital stack. Capital stack ranks the priority of different sources of financing. Senior and subordinated debt refer to their rank in a company's capital stack. In the event of a liquidation, senior debt is paid out first into one debt instrument. The borrower of this type of loan pays a blended interest rate that falls between the rate of the senior debt and subordinated debt. Unitranche debts started in the United States in 2005 and gained popularity as a financing option in the European leveraged loan market from 2012. The main goal of unitranche financing is to make debt-financing terms flexible and increase access to capital for companies. Borrowers not only increase market liquidity but also bring new energy to a traditional debt market. The main providers of unitranche debts are the non-traditional lending entities such as debt funds and other institutional lendersTop Banks in the USAAccording to the US Federal Deposit Insurance Corporation, there were 6,799 FDIC-insured commercial banks in the USA as of February 2014. The country's central bank is the Federal Reserve Bank, which came into existence after the passage of the Federal Reserve Act in 1913. These lenders focus on acquisition finance and middle market lending. This form of lending was popular during the financial crisis and the credit crunch that followed when troubled companies were unable to access loan facilities from the mainstream credit markets. Usually, under the unitranche financing, a single lender provides the entire credit with only a single set of documents. The main beneficiaries of unitranche debt are the middle-market corporate borrowers with sales of less than $100 million and an EBITDAEBITDAEBITDA or Earnings Before Interest, Tax, Depreciation, Amortization is a company's profits before any of these net deductions are made. EBITDA focuses on the operating decisions of a business because it looks at the business’ profitability from core operations before the impact of capital structure. Formula, examples of less than $50 million. Unitranche debt works as an alternative credit market for companies that may not have easy access to large credit facilities from traditional financial institutions. The average size of a unitranche loan is $100 million, and it is often used to finance leveraged buyouts such as management buyouts and private equity acquisitions. Unitranche financing involves a single credit agreement and requires one set of collateral documents. It reduces the amount of documentation and paperwork that borrowers need to comply with before they can access funds. Traditional leveraged financing like junior, mezzanineMezzanine FundA mezzanine fund is a pool of capital which invests in mezzanine finance for acquisitions, growth, recapitalization or management/leveraged buyouts. In the capital structure of a company, mezzanine finance is a hybrid between equity and debt and senior debt require separate documentation, plus borrowers will have to comply with different covenant packages in each debt. This means that for a borrower to qualify for a single debt, they have to fill out several documentations, which takes both time and effort. The only instance when a borrower may be required to fill out more than one document in a unitranche debt is when there is a revolving credit facility that needs a separate loan agreement. A unitranche lender may seek non-call/early prepayment protection for the first 12 to 24 months of the loan’s life. The prepayment fees and the length of the non-call period vary from one market to another but is it negotiated before reaching a final agreement. Most lenders include a “make-whole” provision in the credit agreement for the first two years so that any interests and fees that are due during this period can be paid alongside the other prepayment amounts. In the absence of this provision, some lenders may charge an extra 1%-2% on top of the prepayment amount. A unitranche debt comes with a single interest rate and maturity term, which is usually between five and seven years. Unitranche financing usually requires a one-time lump-sum repayment of the entire loan at maturity. One of the benefits of unitranche financing is its simplicity, compared to the traditional credit facilities. Borrowers only go through a single process of approval and prepare one set of documents for the lenders. Also, taking on a single debt instrument that is a combination of two types of debts reduces the number of legal reports that the borrower would be required to prepare. Due to this simplicity, borrowers are willing to pay a premium fee above what they would have paid to a traditional financial institution. When dealing with a time-sensitive transaction, unitranche financing gives the borrower the advantage of dealing with a single lender, and this helps to close the transaction quickly. This is unlike traditional credit loans where a borrower needs to deal with different lenders and provide several legal documents. Since the borrower is dealing with a single lender, he can negotiate for flexible covenant documentation, amortization rates, and prepayment terms. Also, the borrower will incur lower administrative costs since only one administrative agent is authorizing the debt instrument. In addition, unitranche financing allows small and medium-size companies to access financing that would be impossible to get from a bank. Usually, most banks impose restrictive regulations that disadvantage small borrowers who are not as stable as the large companies. Unitranche financing gathers these lenders together to negotiate and come up with favorable terms that do not restrict small borrowers. When these senior lenders agree to the deal, they can offer a significant amount of senior debt and earn high interest in the long run. Unitranche debts usually come with call protections that require the borrowers to make prepayments for a certain predetermined period. The call protection locks borrowers in debt for that minimum period, such that they cannot use their excess cash reserves to pay the debt off in voluntary lump-sum amounts. Unitranche financing possesses a few characteristics that are similar to equity financingCost of CapitalCost of capital is the minimum rate of return that a business must earn before generating value. Before a business can turn a profit, it must at least generate sufficient income to cover the cost of the capital it uses to fund its operations. Cost of capital consists of both the cost of debt and the cost of equity due to some of the contractual features contained in an unitranche agreement. One of the similarities between these two forms of financing is the comparability to shareholders. Just like shareholders, the goal of unitranche financing is to provide capital for long-term syndication. It offers the benefit of ensuring efficient decision-making during the loan period and also in negotiating the debt agreement. In equity financing, investors participate in the decision-making process and are entitled to be informed of the company’s future plans. If the company decides to liquidate, shareholders are entitled to receive a share of the company after secured creditors are paid. Similarly, unitranche providers request shares in the borrower’s company with the aim of gaining control over the company should an enforcement event occur. The lender also sends advisors to the borrower to provide market knowledge on strategic matters. Learn more about financial modeling and valuation with CFI’s online valuation modeling courses. In addition, the resources below will help you in your journey to becoming a world-class financial analyst. Junior TrancheJunior TrancheA junior tranche is an unsecured debt that ranks lower in repayment priority than other debts in the event of default. It is also referred to as subordinated debt. When a company goes into liquidation or bankruptcy, the creditors receive payments in order of priority, with senior debt receiving payments first.